Directly below your feet is an ingenious method of flooring that has been used for centuries—and is still employed today. It is flexible, it can be changed out, it is inexpensive. This method of laying a sturdy subfloor on top of joists and then topping the subfloor with a cosmetic-only flooring top creates a tighter, stronger structure. Layering makes it easier to change the visible floor if you tire of the look or if it has become damaged. Relying on the joists to shoulder the brunt of the load means that this floor top can be practically anything you like, as long as it performs a few basic duties like resisting foot traffic. But one thing that this top—called the floor covering—does not have to do is to provide structural support. Let's delve into the multiple flooring layers, define them, and give you installation options. This is the visible floor—the one you see and walk on—and can be changed out. Not required to provide structural support, but often provides a type of supplementary support. When you remove the floor covering, you will see more flooring underneath—possibly underlayment, definitely subfloor. Called a floor covering or finish floor, this might be ceramic tile, solid wood, laminate, engineered wood, luxury vinyl, carpeting, and many others. "Floor covering" is the most apt description, since everything below—the substrate—can be considered the "real floor," in terms of structure and permanence. Substrate is a general term that means any surface below another surface but which, in the home remodeling world, most often refers to the stabilizing layer of material directly beneath the finish floor. Like coverings we are familiar with in other aspects of our lives—clothing, bedspreads, area rugs, paint—floor covering is mainly about aesthetics while providing minimal protection. Underlayment is an optional layer that is less about structure than about providing a smooth, consistent surface for the floor covering. You will not always find this intermediary layer, as it is often not required. If you are installing solid hardwood or engineered wood, you may be putting down an underlayment of plywood. For wet, mortared applications, such as tile and stone, cement backer board may be your second level down. Laminate flooring gets a completely different type of underlayment—a thin foam that comes in rolls and which gets taped together. The subfloor is the thick flat surface on which all other layers rest. The subfloor is the bottom-most layer and it rests on the joists. If you have a concrete slab floor, the slab may be considered the subfloor. Typically made of plywood or OSB and ranging in thickness from 19/32" to 1 1/8" thick, the subfloor is truly structural, second only to joists in this respect. Subfloor holds up all of the above layers of flooring, as well as everything in your house—people, dogs, cats, pianos, furniture. All houses have subfloors. While not precisely a "floor layer," joists are an essential part of the entire floor layering matrix. If you have a concrete slab floor, you will not have joists. Joists are structural; they support everything above. Joists are made of engineered, laminated wood or of dimensional lumber. Except for those that have concrete slabs, all houses have joists. In rare instances, you may have only one layer of flooring. A stained concrete floor in your kitchen is just one layer. Older homes may have solid hardwood flooring nailed directly on the joists—no subfloor. If the subfloor is smooth enough, an underlayment may not be needed for laminate. Hardwood flooring may be installed straight onto the subfloor, with only a sheet of red rosin paper intervening. On the other hand, floors sometimes have more than three layers. A prime example: old homes that have been extensively remodeled. It is not unusual to see so many layers that a cross-section of the flooring looks like a wedding cake. There is little reason to have more than three layers of flooring (subfloor, underlayment, and floor covering). The reason old homes have these built-up floors is that previous owners did not want to incur the expense or take on the labor of removing unneeded floor layers. Often it is necessary to find out the type and thickness of your floor's layers. For example, base flooring layers need to be absolutely firm, flat, and deflection-free for ceramic tile or natural stone. Heavy objects such as cast-iron tubs, refrigerators, and clothes washers need strong flooring. 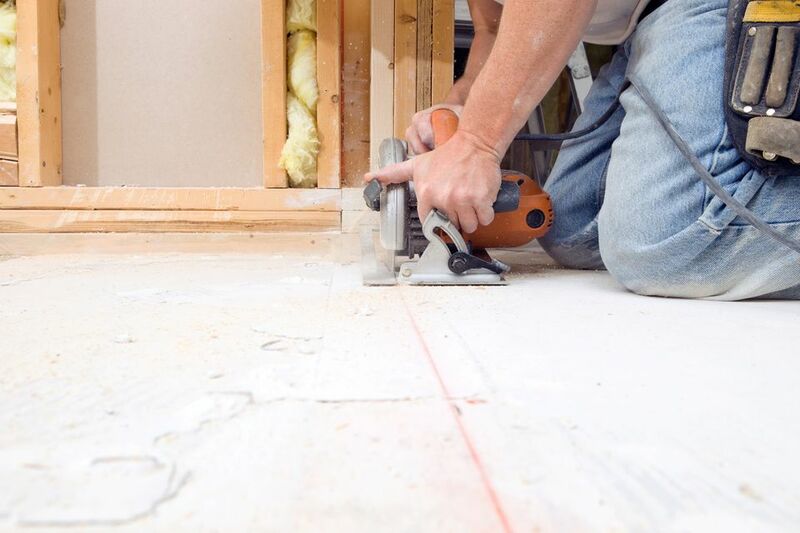 If you are planning on building an interior non-load-bearing wall, you need the strongest subfloor possible. Here are suggestions for ways to find out how thick your floor covering and/or subfloor are. You will need a straight edge ruler or tape measure. Floor Heating Vent: Removing a floor HVAC vent is the best way to check for total floor thickness. If you have central heat and/or air conditioning with floor vents, it is very easy to remove the vents by pulling them straight up. With the vent removed, you have a wide, clear view of a cross-section of your floor. Top of Stairs: Sometimes, the top of a staircase has an unfinished opening that permits a cross-section view of the entire floor. Even if the stairs are fully finished, you can get an approximate reading of the stairs' thickness by measuring the distance from the top of the riser to the top of the finish flooring. Crawlspace or Basement: This method only measures subfloor thickness. But combined with other methods that measure the finish floor, you can get a fairly accurate reading of total floor thickness. If you have an older subfloor constructed of multiple slats, rather than large sheets of plywood, you can insert your straight edge between the slats. In a Closet or Pantry: This method only measures the thickness of the floor covering. Often, closets or pantries do not have baseboard molding. By placing your straight edge along the wall, you can insert it between the floor covering and wall, sliding it down until it touches the subfloor.